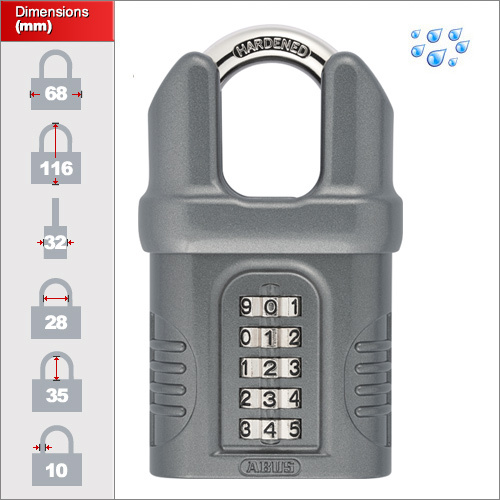 For a while now the the UK market has been asking for a combination padlock, that is weatherproof and comes in a closed shackle design. Add to that a hardened steel shackle and the same die cast metal zinc body used in the rest of the 158 series. The padlock has a three quarter closed shackle design. So when the padlock is open the shackle swings out from the padlock. In some fully closed shackle designs you can remove the shackle completely. The closed shackle design makes it significantly harder to attack the shackle compared to the open shackle versions. It's certainly feels very solid and weighty in your hand and you can see it is very well made. Given this you would expect them to be just as reliable as the rest of the 158 series. 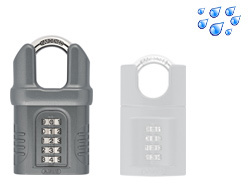 They come in two sizes a significant 50mm and an even larger padlock than before at 68mm. The padlock comes in two sizes. A 50mm with a 8mm shackle that uses 4 dials. Then the largest in the 158 range the 68mm with a 10mm shackle that uses a massive 5 dials. This padlock can be used in companies and organisations where there are a large number of people requiring quick access. They are useful where you don't want to give out keys to large numbers of people and it is more secure than the open shackle version.